At the Children’s Advocacy Center of Suffolk County (CAC) we provide specialized and trauma-informed medical care for children after abuse. After a disclosure or concern of sexual abuse, it is often helpful for a child to see a health professional. The CAC’s forensically-sound, medical services are offered onsite by a specially-trained pediatric sexual assault nurse examiner (Pedi-SANE). Medical services are provided in our specially designed, child-friendly examination room and we use state-of-the-art equipment. The medical exam is not painful or invasive. Address any underlying medical, developmental or psychological concerns. The medical examination also provides an opportunity for the child and family to be linked to other important services and resources. For children who lack access to consistent medical care and may have previously-undiagnosed medical conditions, the Pedi-SANE provides care and makes referrals for follow-up, as needed. The Pedi-SANE focus and motto is based on the principle of Do No Harm in treating each and every child. 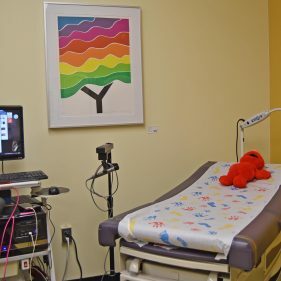 The Children’s Advocacy Center of Suffolk County provides medical exams at no charge to children and families. Pedi SANE provides training for medical professionals on how to collect forensic evidence utilizing the Massachusetts Pediatric Evidence Collection Kit, for acute sexual assault child victims. What is Commercial Sexual Exploitation of Children (CSEC)? The Children’s Advocacy Center of Suffolk County (CAC) unites public, private and community partners to promote safety, healing and justice for child victims and their families. © 2019 Children's Advocacy Center of Suffolk County The Children’s Advocacy Center of Suffolk County Inc., is a 501(c)3 nonprofit organization.